A joint is a place where two bones come together. They never actually touch but are connected through a joint capsule. When movement takes place, it happens because two bones, connected at the joint, are brought closer together or moved further apart. 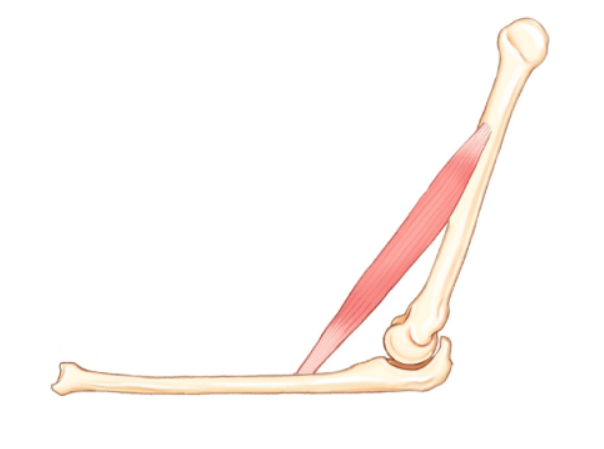 This is the role of whichever muscles are inserted on either side of a particular joint. Some muscles are long or wide enough that they cross multiple (two or sometimes three) joints, and can thus move all the joints they span. However, it is known that when muscles span two joints, they are not able to move both as efficiently at the same time. For instance, make a tight fist. This involves a flexing of the fingers. As you bend the wrist backwards the fist remains tight but if you bend the wrist towards your palm, the fingers loosen a bit. Why? 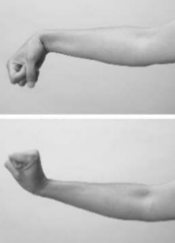 The muscles that flex both the fingers and the wrist cannot be maximally efficient at both joints. The term for that “incapability” is “active insufficiency” (ie when the muscles are actively trying to contract at both ends there is an insufficiency in their capability). So this affects the golf swing how? In a manner no one realizes because most of those influencing how the golf swing is made do not have a deep understanding of the design of the human body and thus its capabilities with respect to how best to make a golf swing. Regardless of what a golfer does in the downswing, in order for a ball to go high, straight, and far, the club must be delivered to the ball from an inside path, with an adequate angle of approach (attack) and at maximum speed. That’s all. Neither the club nor the ball care about the design of the human body! If the club must be delivered from the inside (the most important of the five ball flight laws - but see the note at the bottom to understand current thoughts on the subject), then the arms and trail shoulder (right for the right handed golfer) must also be “arriving from the inside” by being behind and below the lead (left for the left handed golfer) shoulder, elbow and wrist. Most golf swings are, from an anatomical perspective “over the top” (OTT) and therefore not “from the inside”. Even the best of them. How so? Because either the trail shoulder is forward (towards the ball/target line) of the trail toe at impact (when viewed from down the line), and/or the trail thigh and knee point forward (towards target) and down, and/or the trail elbow is behind the trail shoulder when a vertical line is dropped from the shoulder downwards. In the picture below all golfers are PGA/LPGA Tour players. OTT happens because the start of the downswing is predominantly downwards rather than rotational (as with less skilled golfers) or because the pelvis rotates so early and so fast (as in more skilled golfers) during the downswing that the trail thigh or shoulder gets pulled down and forward as well - too much too soon. So what muscle-positions at the top of the backswing cause the excessively downwards and forwards movement of the trail side? The higher right shoulder (which is always lower at address and impact so why do all golfers raise it at the top?) and the fact that the arms have moved away (to a lesser or greater extent) from the body. This makes some powerful muscles of the shoulder and trunk stretch, so that they will contract more forcefully. Moreover, the more they are stretched upwards (because everyone raises the trail shoulder), the more they will contract downwards. See the pictures below of the same golf pros as above in their top-of-backswing positions. The three pictures below show 1. a rear-side view of the powerful lats i.e. latissimus dorsi muscle that moves the trail upper arm away from the body during the backswing, and 2. and 3. the external oblique (EO) muscle of the torso, which, depending on which direction it has been stretched in during the backswing, can drop the torso downwards or rotate it. With all these powerful muscles stretched in an upwards direction, a less experienced golfer who has not developed sophisticated lower body movements will simply hit straight down. He/she cannot help it - that is all that his/her muscle-positions at the top will permit, during the downswing. More skilled golfers, trying to generate a good ground-up body sequence, somehow make a race against time to rotate their pelves towards target in the early downswing. 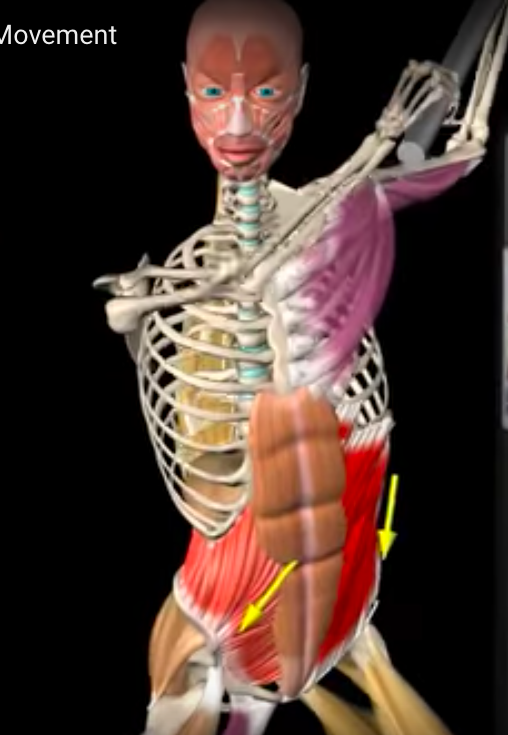 However, because the torso muscles are all interconnected, pelvis rotation inevitably results in the upper trunk being pulled down and forward too. So, as long as, at the top of the backswing, the trail side shoulder/shoulder girdle is higher and the trail arm has moved upwards too, resign yourselves to some degree of OTT! With the Minimalist Golf Swing, its “magic move” is to keep the trail shoulder and trunk lower than the lead one, throughout the backswing. This stretches the trail side external oblique muscles more horizontally than upwards so they will rotate the trunk rather than pull it downwards. What about the lats? It is two-jointed muscle, connected at the spine and also at the upper arm. 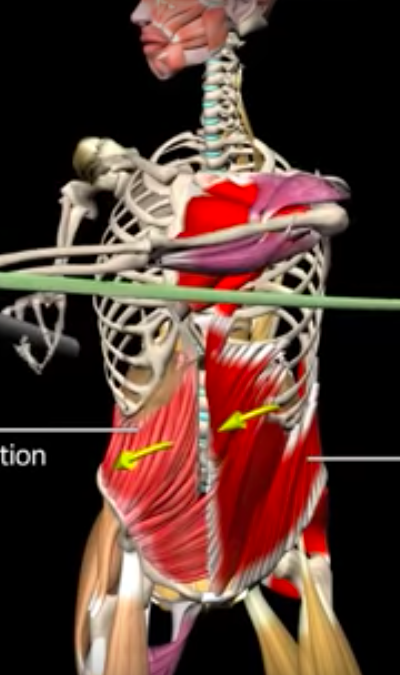 So when the “trail-side-lower” of the MGS backswing keeps the muscles active at the spine, by keeping the spine in side bend, the lats are not able to be stretched as much at the upper arm, and so do not aggressively pull the trail arm towards the body while the trail side EO is moving the torso downwards. Imagine a golf swing with no need to think about ground-up sequencing because the pelvis cannot help put rotate early in the downswing. Imagine a golf swing where the depth of the divot can be manipulated merely by the height of the hands; or the plane of the swing merely by how closed the shoulders are at address. Imagine never having to jump up and down with the torso to harness ground reaction force because merely pushing down through the feet is adequate to “use the ground”. Imagine, moreover, never having to go extra steep with the club shaft in the backswing to shallow out its downswing plane (not anatomically repeatable unless the pelvis rotates out of the way fast), or making the hand path steep to shallow the club shaft’s downswing path. What a load of nonsense golfers have been fed by those with inadequate scientific knowledge in all the aspects of kinesiology. All one has to do is place the entire body, at the top, so that all the bodies joints can EASILY be unbent or untwisted, in the manner most suitable to their design, in the right sequence, for their desired positions of the downswing. With the advent of sophisticated launch monitors, people have noticed that in order to produce a straight shot, the slightly steeper angle of attack (ie a descending move of the club towards the ball) required for the irons is best matched with an out-to-in path, and the ascending club angle required for a driver shot, with an in-to-out path. Common suggestions that are made to facilitate that include moving the ball position suitably or using even certain trunk side-bending angles at address. However, we have just proved that it is the direction of stretch of core muscles at the top that will determine how the body and arms, and thus club, move during the downswing, so any preparatory positions are trivial. Additionally, the modern swing (and its many variants) is a narrow, confined movement so there is no place or time within which to reroute important joints/body parts in order to allow the arms a truly “inside approach”. Thus, OTT has become “par for the course”. This natural OTT and its intrinsic out-to-in path at impact may work for the irons (nevermind the unnecessary and injuriously deep divots it digs out). So the “experts’ have merely found a way to tell you to continue doing what you do most naturally. 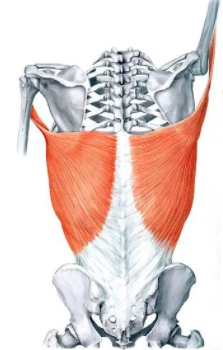 For the driver, the reason why even the pros still have inconsistency is that they continue the out-to-in path (albeit to a lesser extent) – because their EO and lats cannot help it! Ofcourse, a golfer with a long, loosey-goosey arms swing will often (not always) be able to drop the arms into and inside the “slot”, but this will depend upon timing, which, research shows, changes under pressure. Finally, the "magic move" of the MGS is the only one that prevents any degree of OTT. It is designed for perfect – and unconscious – downswing sequencing so that a golfer cannot help but arrive at the ball from the inside, on a consistent basis.